I wanted to make a card that celebrates all the super wonderful teachers out there and I thought the Teacher Desk Cuppie stamp was perfect for it! My starting point was with the pretty green and blue pattern paper I selected from Cosmo Cricket for the background...don't you think it's pretty? I paper-pieced some that paper for the desk as well. Then, I used a bunch of my Copic Spica glitter pens and colored all the accessories on the desktop with it. Gotta love all that sparkle! I ran into a little snag trying to find a red pearl to add to Cuppie's head but then I remembered I had some white pearls on my desk and used a dark red Copic to color the surface of the pearl...perfect! I hope you enjoyed my creation for the hop and have fun checking out the rest! Happy Wednesday! Gosh, this week is going by fast, isn't it? I hope everyone had a fun Valentine's Day...I sure did! My husband and I saw a movie and he gave me a yummy milk chocolate Toblerone bar...it's one of my favorites! It's always hard for him to decide what to get me because I never want him to waste money on buying me a card (no way) unless he makes me one. So, chocolates and sweets are the next best thing and I'm a total happy camper! I pulled this picture out of my archives...I though it was fitting for today's post! 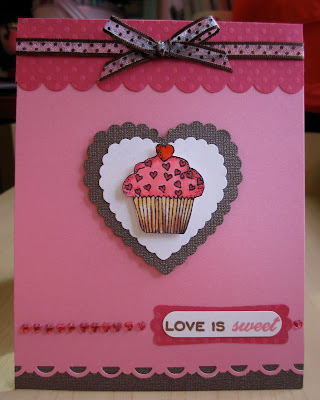 I so love this cute heart cupcake stamp from Karen Lockhart. I wanted this card to look like it was the front window of a boutique-y cupcakery so I used a scallop border punch on the top part to make it look like an awning. Look at strip of bling I used on the bottom! I don't think I've ever used that much sparkle on a card...I LOVE IT! I also love that the card is pink and brown, my two favorite color combos. It's supposed to rain the rest of the week in my area, which I don't mind so much. More time to craft I always say! Have a great rest of the week and thanks for stopping in! Happy Sunday! I can't believe tomorrow is Valentine's Day already...wh-AT?! What are you doing to celebrate tomorrow? Or have you celebrated already over the weekend! I made this card for my friend Stephanie last year. I think it turned sooo sweet, don't ya think? Valentine's Day is my second most favorite holiday of the year (Christmas being first) because I LOVE hearts, red and pink! How about that cute image in the heart center? Isn't she adorable? 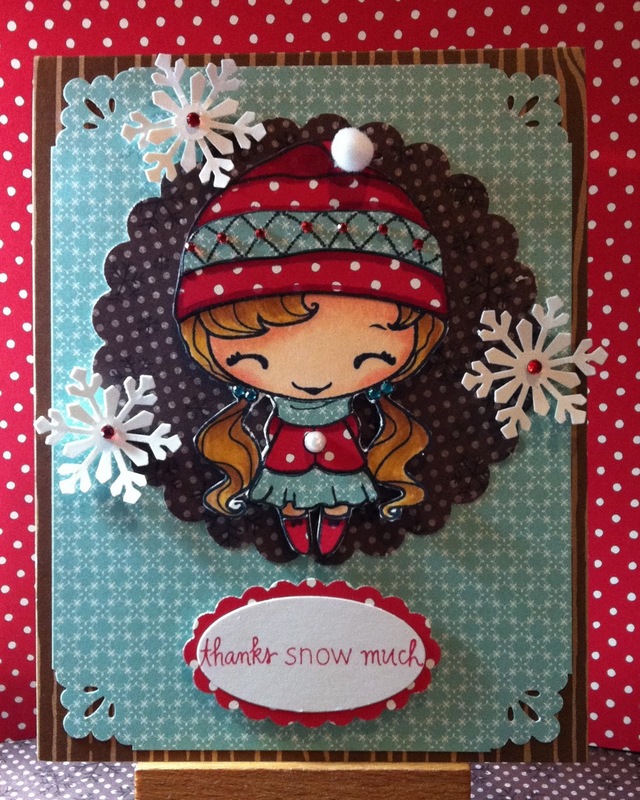 Her name is Peggy Polka Dot from Poppy Stamps. I colored her in with my Copic markers. 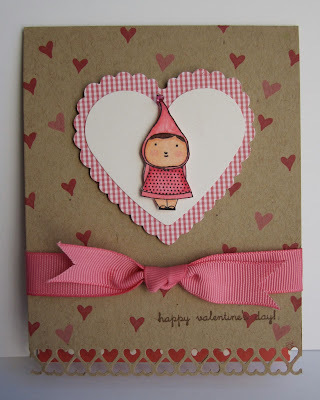 I used a tiny heart stamp from A Muse and randomly stamped it in red and pink chalk ink for the background. To make the grass on the inside of the card, I took two shades of green (dark and light) Copic Sketch markers and "flicked" blades of grass using the brush tip end. The tree stamp is by Memory Box. It is a two-part stamp where the tree part is one stamp and on the end of wood block, is a teeny tiny stamp of there tiny hearts for the leaves...I absolutely adore it! 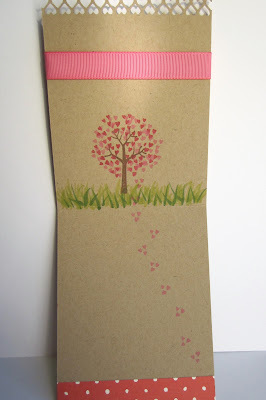 You can kinda go crazy repeatedly stamping heart leaves all over the branches like I did! For added interest, I stamped a trail of leaves on the part of the card where I wrote a message. Hope you enjoyed this card and have a super duper day! Hello...yes I am still here! This has been the longest time ever from posting something! I can't believe we are in the month of February already! We sure are zipping right along in the new year, aren't we? Last Friday, I went to my friend Tiffani's house for an evening of fun, crafts and chatter! 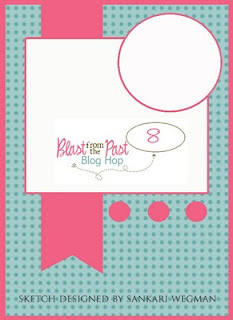 My other friend Karen, who apparently reads my blog, gave me a hard time for not keeping up with my blog...hee! So, I thought I better stop in and post something before I suffer anymore wrath! 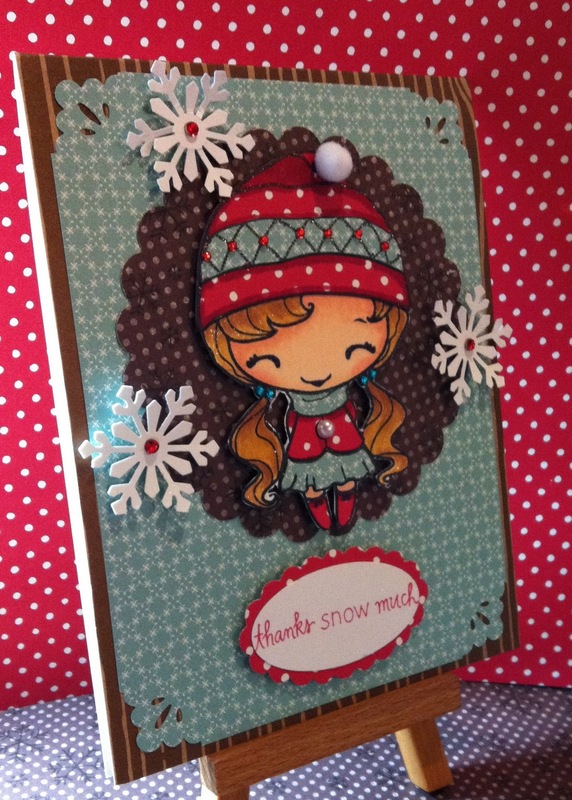 Without further ado, what do you think of this thank you card I made for my crafty friend, Wanda G.? 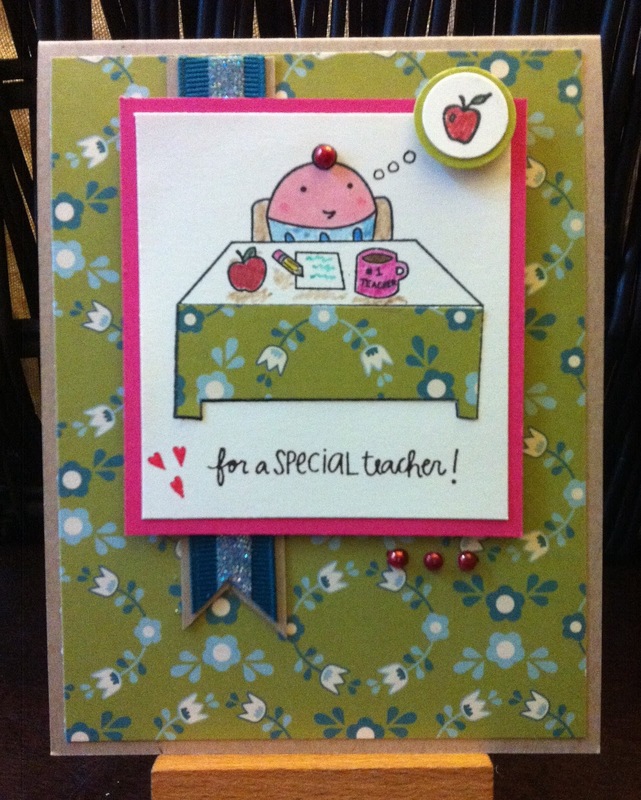 I totally love how this card came together! The image is a fairly new one called Beanie Anya from The Greeting Farm. I was itching to use Dave Brethauer's new pattern paper from Memory Box so I decided to paper-piece Anya's hat and outfit with all that yummy paper! I used skin-toned Copic markers for the face and yellows and browns for the hair. 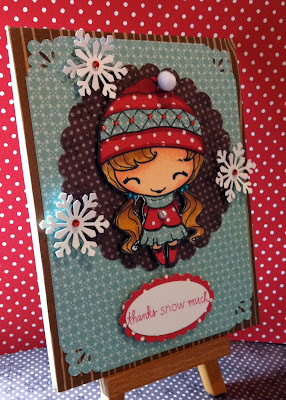 The woodgrain card base, twinkle gems, and sentiment are by A Muse. The snowflakes are made using a Martha Stewart punch and I popped them up with some foam tape for dimension. Well, I hope this card will tie you over until my next post! I have been such a busy bee ever since the holidays hit last December! I've finally had a chance to get some coloring in so I'll be back again soon...pinky swear!